This year we took our very first BIG family vacation- we flew to Orlando for the week of Halloween. We take a vacation every summer, but normally we only drive about 2 hours away to our favorite beach resort. Since our girls are finally old enough to all enjoy Disney World and Universal, this was the perfect year for our first trip. Planning was crucial for a successful and fun vacation. We have a 3 year old, a child with Cerebral Palsy (which presents strength and stamina issues), me with my severe lactose intolerance, and the oldest with a newly diagnosed deadly tree nut allergy. As I mentioned, planning was CRUCIAL to this trip. For the sake of length of this post I will write only about meals while we were on our trip. My parents joined us, so finding dining options for 7 people, that would accommodate me, was a bit of a challenge. We spent a couple of evenings going through online menus, making notes of the most allergen-friendly places on property, calling Disney World, and making meal reservations. We did get one of the meal plans, which allotted each of us 20 snacks, 10 quick service, and 7 sit-down meals, for 7 days. Two days before our trip we mailed a box of food to our resort. We filled it with: two cartons of shelf stable almond milk, a box of the girls' favorite (organic) cereal, granola, small packs of organic popcorn, crackers, peanut butter pretzels, pita chips, and more. Basically easily packable snacks to take into the park. Disney World DOES allow their guests to bring in outside food. We decided to fly to Orlando rather than drive to save a day of travel. From where we live it was a 1.5 hour hop to one airport, then a 45 minute hop to Orlando- so not too much time in the air. I packed organic lollipops for in the air (my kids don't chew gum but needed something to ease the ear pressure), packs of Annie's Bunnies, organic popcorn, and granola for munchies. The hardest part was our lunch in between airports. There are very few healthy options for the traveling public. My husband and I walked the entire concourse during our 90 minute layover in order to find a suitable lunch for our girls. We settled on Honest Tea juices, fruit cups, cheese sticks, and crackers. That was honestly the very best option. Sad, but true. Once we landed, our transportation was waiting for us at the airport. After a short trip to our resort, a very easy check-in, and exploring our hotel a bit, we were on our way to Downtown Disney in search of dinner. We chose to eat at Fultons Crab House, because they served salmon and I could get it made to order. Dinner was decent that night, but my fish was salt encrusted, which I do not like. I will say our waiter was quite good, and they had some terrific, healthy options for kids. They are pricey, but covered on your Disney Dining Plan as a table service. 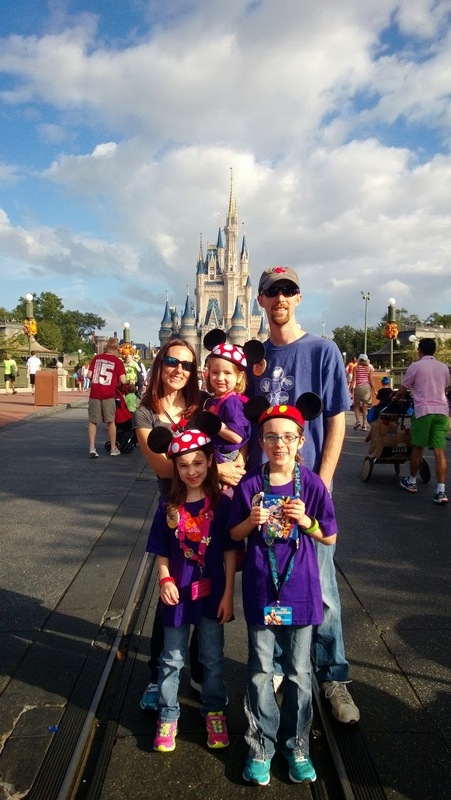 Our first day at Disney World was on Halloween, and we headed straight to The Magic Kingdom. We had bought tickets to Mickey's Not So Scary Halloween Party later in the evening. Plus, when you go to Disney, you have to start your trip at the Magic Kingdom! We had reservations at the Crystal Palace for a late lunch- a sit down character dining with Winnie the Pooh and Friends. The chef went through the entire buffet with both my daughter and me, showing us what we could and could not eat. On a negative note- he did forget to bring my meal, but I had two servings of salads from the buffet so I didn't leave hungry. For snacks at the parks they had carts with Honest Tea juices, waters, fruit. It was also covered under our meal plan. Day two we ventured to Epcot for the day. We met up with my husband's sister and her husband. Since they live in Tampa they were able to come spend the day with us. We didn't have reservations anywhere so at lunchtime we wandered to Japan in the World Showcase and found their Tokyo Dining restaurant. I spoke to the manager and we were able to get veggie sushi that was INCREDIBLE. It was so good we ate there a second time- for dinner on our very last night at Disney. On our 3rd day, which was a rainy Saturday, we took a day off from the parks and went to explore and shop at Downtown Disney. For lunch we hit up Babycakes Bakery- a totally allergen free bakery. Yes, I know that doughnuts are NOT the best lunch, but man they were GOOOOD! We bought a box to bring back to the hotel so I could have breakfast the remaining days we were there. For dinner we went back to Fulton's that evening since we had had good luck there before. Unfortunately my luck ran out. All the adults ordered steamed Alaskan crab legs. I had a conversation with our waiter and the chef and they both assured me my meal would be fine. And I have to say my meal was delicious. However 20 minutes after I finished eating my tummy rebelled in the "oh no I had dairy" kind of way. Totally ruined the remainder of my evening. Those of us with food allergies/sensitivities/intolerances know that is always a risk we take when eating out. But it still stinks when it happens. Luckily after some medicine I was feeling a tad better. Our thinking is that my plate and my husband's plate got mixed up when we had to send the crab back because it wasn't quite warm enough. Not enough dairy to make me violently ill, but enough cross contamination to make me wish I hadn't eaten at all and to ruin my evening. :-( Good news- by the next day all was well. Breakfast was a bit of a challenge. Our hotel had a cafeteria style restaurant. They served Belgian waffles, bacon (I don't eat bacon EVER), eggs, hash browns, oatmeal... basically all things made with dairy. My husband would bring me fruit and a V8, which were the best dairy free option there. Luckily I like V8 and fruit. If you need a more substantial breakfast, I recommend calling ahead and asking how they can accommodate you or your child. Day 4 we headed off to Universal Studios- Islands of Adventure. Our first destination- The Wizarding World of Harry Potter. Before we left I had read that Universal was the worst park for dealing with food allergies. I was very pleasantly surprised to find that was not true. I did know that Butterbeer was probably not an option for me, so I opted to try the pumpkin juice instead. I think I won on that one because the general consensus on the butterbeer was that it was "way too sweet". At each "movie" section they have snack carts with several fresh fruit options, water, juices. At one point I was starving so I snuck off and grabbed a bag of red grapes for less than $2.50. It was about the size you would get at the local grocery store. Big enough to share with several people. For lunch we tried our luck at the restaurant called Mythos. I figured I wouldn't eat lunch, but the main chef came out, went over vegan options with me, and made my meal herself! I had Pad Thai and it was DELICIOUS. Hands down the best meal I had on vacation. The park closed at 7pm so we opted to eat on the way back to our resort. We stopped at a Chipotle, which is dairy free friendly. There is also a Whole Foods in Orlando in between Walt Disney World and Universal, closer to Universal. Day 6 was back at the Magic Kingdom. We ended up at a quick service in Tomorrowland at Cosmic Rays Starlight Café for lunch. Again I spoke with the manager and got a made-to-order allergy free meal: a grilled veggie sandwich on ciabatta bread with fries cooked in the allergen-free fryer. It was quite good! Day 7 was our last day on vacation. We went to Hollywood Studios for the day and had reservations for a table service meal at The 50s Prime Time Café. The menu there was mostly old style comfort foods- meatloaf, roast, fried chicken. Again I spoke with the chef and they made me a poached salmon with sautéed greens and fries ( I couldn't have the other sides because they all had dairy.) For dinner we went back to Epcot for the fireworks and sushi. Seven days, only one relatively mild mishap. Not too bad for someone with a severe lactose intolerance who cannot eat out in her hometown. I would most definitely go back to both Disney World and Universal again, and eat with no fear of getting sick from dairy. My oldest daughter has a severe allergy to tree nuts and that was not a problem either. My favorite meal: Mythos in Universal. 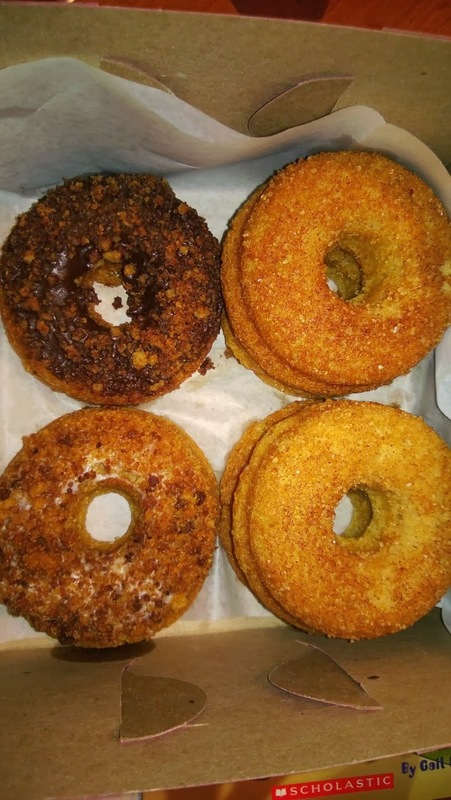 Favorite snack: Babycakes Bakery in Downtown Disney. 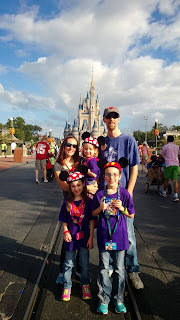 If you are planning a trip to Walt Disney World I recommend visiting the Allergy Eats Disney World website. They were a great source of planning information for me.